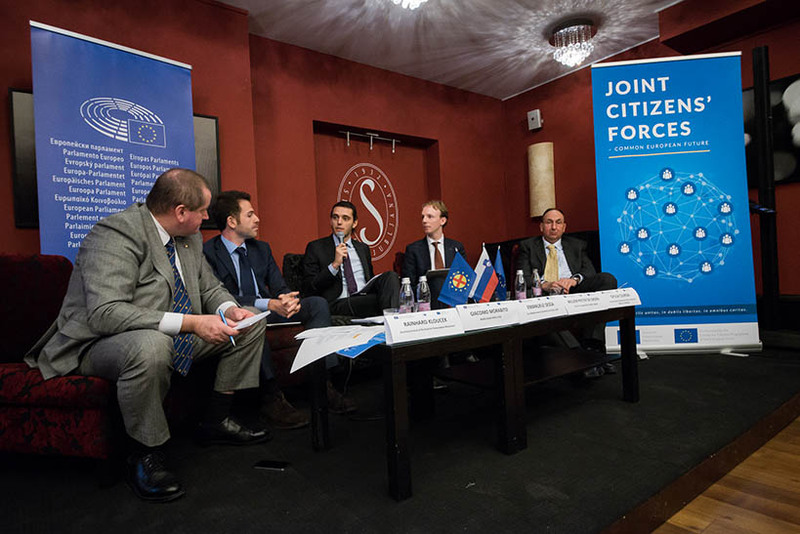 Emanuele Sessa participated to the international conference Understanding the European Union, organised in the frame of the project Joint Citizens’ Forces – Common European Future, of which EMEA is a partner. He was part of the panel focusing on the relationship between EU institutions and EU member states. He started his speech presenting EMEA as an independent forum providing forward-looking thinking on the Euro-Mediterranean region driven by the belief that a united Europe can thrive only with an integrated Mediterranean, to the extent that member states and partner countries of the EU in the region have many challenges and opportunities in common that must be leveraged for a balanced development of the union as a whole. In light of this, he stressed the importance of a win-win Euro-Mediterranean Partnership, something which is reflected in the rhetoric surrounding the agreements signed with partner countries, but unfortunately not in the reality on the ground as strikingly attested by the steady increase of trade deficits in Mediterranean partner countries since the signature of Association Agreements with the EU. He then argued that this discrepancy between the rhetoric surrounding the Euro-Mediterranean Partnership and the reality on the ground has to do with the relationship between EU institutions and EU member states being skewed towards the latter. In fact, the institutions of the EU are more the reflection of a continuous compromise between the national interests of its member states than expressions of a common interest and related vision, explaining the tendency to react rather than act in the relations with Mediterranean partner countries. This is a problem as it translates in a lack of political will when it comes to make the concessions to partner countries needed for the Euro-Mediterranean Partnership to be mutually beneficial. He then added that even when concessions are made, as in the emblematic case of duty-free imports of Tunisian oil, leaders of EU member states do not take responsibility in front of their citizens for the decisions taken in the European Council, while it is crucial to sensitise the public opinion on the importance of making such concessions to tackle issues such as migration at their economic roots.